Flights | Hotels | Holidays | Cruise Lines Bookings- Travel Ideas: Holiday Packages to Greece-The Wonder World!! The charismatic country of Greece assures a year round fun filled holiday to all the tourists. The marvelous country offers amusement activities for kids, relaxation and rejuvenation for parents with a perfect blend of family-friendly and opulent accommodation. The white beaches with crystal clear waters, cloistered coves and fantabulous ﬁshing villages await you. You’ll be astounded to see the picturesque towns alighted on rocky hillsides surrounded with beautiful church domes with the backdrop of the golden glow of a ceaseless sun. All of which and much more are covered in intricately designed Greece Holiday Packages by many reliable travel websites. The holiday packages offered not only consist of sight-seeing but also affordable air-tickets to the destination and good accommodation. The glorious country of Greece is dissevered into three geographical regions namely the mainland, the islands and the Peloponnese which being the large peninsula to the south of the mainland. Our unique Greece vacation packages, lets you experience a perfect holiday comprising of island hopping, digging into fascinating mainland’s ancient history and relaxing on number of divine golden beaches - all at fabulous affordable prices! You can reach this amazing country via Athens International Airport. Athens offers you the magical start to your journey by being the site of the most popular heritage site, the Parthenon. Hundreds of tourists every day make to the site to closely experience the beauty of the Classical period of Ancient Greece. There are no less than 17 monuments in this fantabulous country which are listed as World Heritage Sites. Few of the other beautiful sites include the massive Sanctuary of Asklepios at Epidaurus and the large Archaeological Sites of Mycenae and Tiryns. Also not to be missed is the Mount Olympus on the way from Athens to Thessaloniki, which being the beautiful mythological palace of the 12 Gods of the Greek Mythology. Thessaloniki ranked as the world's fifth-best party city worldwide is not to be missed for sure. If the idea of your holiday is to relax by the sea side, you have an option to choose from 6000 islands out of which 227 are inhabited. The vast coast line with sandy beaches and sheltered bays would surely rejuvenate you. The massive National Marine Park on Zakynthos Island would keep the kids of the family busy while you bask in the sun at the coast. The enchanting landscape of Crete Island would mesmerize you with its landscapes diverging from sandy golden beaches to snowy high peaks and sensational river gorges. The honeymooners can experience the most romantic vacation in the picturesque island of Santorini. For the tourists wanting to pump their adrenaline must visit Meteora located in the Greece mainland. It is home to various adventurous activities like rock climbing, Canoe-Kayak on Plastira Lake, Rafting Adventure and many more. When it comes to eating out in Greece, food lovers should be prepared to be seriously spoilt for choice with the sumptuous delicacies ranging from traditional to international. The mouth watery seafood is surely a treat to your palate. 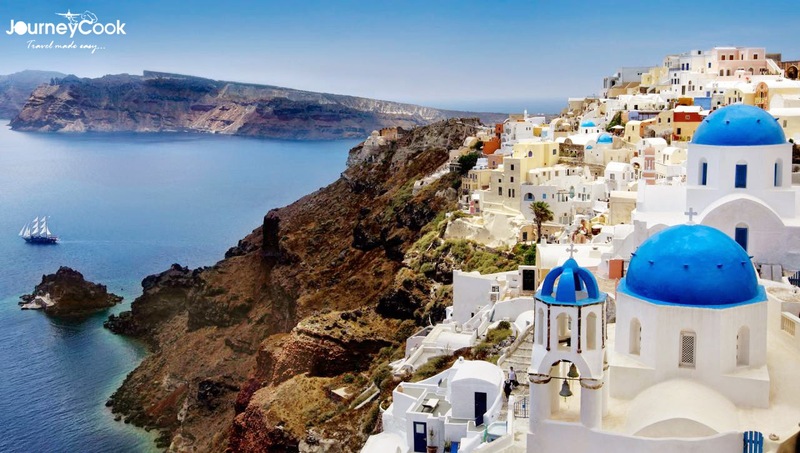 Explore our varied Greece travel packages to have a relaxing and rejuvenating holiday surrounded by the beauty of Mother Nature.